Imam utisak da će im ovaj "alkatrazoliki" zatvor biti najprodavanija policijska stanica ikad! Uboli su gomilu zanimljivih setova. Za razliku od vatrogasne stanice gde su im paneli koji izigravaju rotaciona vrata epski FAIL. Slika trajekta za 2016, po meni sjajan set. Ovo bi trebalo da je prvi trajket u City, Town temama od kad je pocela tema grada pocetkom 80tih, ukoliko zanemarimo 2008-me Creator verziju trajekta. wo new subthemes: Volcano Explorers and Airport, which we didn't know about until today. Volcano Explorers was described to us as being like the City Arctic sets but with the danger of volcanoes. The 6 sets were all vehicles of some sort, lime green and dark grey/black, which looked pretty good. Several of the vehicles are tracked and several come with drill attachments because, apparently, the volcano is spewing out some sort of boulders with crystals/rare metals/whatever inside. The boulder elements are new but similar to the older design which has been around for years. The volcano research base is not a base as such, it's just a couple of vehicles and a, I have to say, rather pathetic volcano which is about 15 bricks high maybe, and 20 studs square -- yes, rather more square than round -- made primarily of BURPS (big ugly rock pieces). It has a mechanism inside to eject the aforementioned boulders. Some of the vehicles looked quite nice but the best of the bunch for me was a helicopter which looked great in lime green. - Passenger terminal and jet, much like previous ones but with new wings, apparently, and a blue nose cone. It certainly looked less 'juniorised' than the older ones. - Airshow: Two jets of different designs, in red, white and black, and a orange biplane complete with wing walker attached. This also comes with a rudimentary hanger, large enough for perhaps two of the planes. - Cargo plane, a small green and white plane. So, really, just updated versions of what's gone before. I'll get them added to the database shortly. Perhaps the most interesting City set was 60143 Fun at the Park which was hidden away on a shelf, which I didn't see. Lucy, however, did and said it looked excellent: a dozen or so minifigs with some very attractive and new torso prints, a new baby piece, a wheelchair, park bench and one or two other accessories. When she's written up her notes we'll know more. 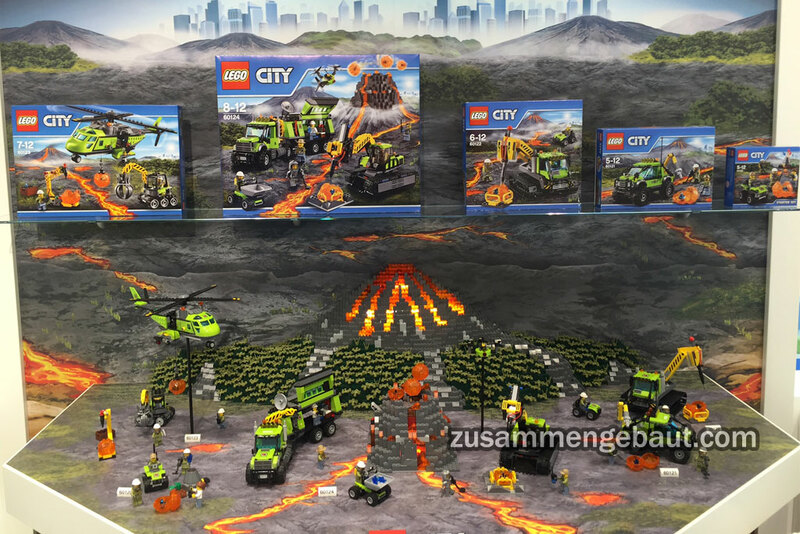 I had spotted the title of this set in the Brickset database but couldn't see it on display when I got to the City section (I had gotten left behind the boys a bit as all the "girly" stuff was at the beginning of our tour!) so I asked and it was tucked away on a shelf. The lady I spoke to said that LEGO get a lot of feedback from customers complaining that they have lots of vehicles and buildings in their Lego city but lack civilians and want to buy essentially a City minifigure pack. This set corresponds to this problem, though the lady said to me it's sometimes tricky to do a set like this because the set will come in a relatively small box for the price point. My feeling is that this will be a big seller though. The other brilliant new piece is a wheelchair mould - a prototype piece was on display -, a seat area with rear handles, to which wheels are attached. It's long overdue, but I think it'll be worth the wait. All in all, my favourite set among the City theme but then I do love my minifigures! Malo mi je mlaka reakcija. Bukvalno kopija Arktika (koji je bio odličan, sa izuzetkom par meni nezanimljivih setova). Helikopter izgleda prelepo, i onaj drugi set po veličini mi je simpa (podseća na vozilo koje je išlo u rudarskoj temi). Ovaj kamper im je jedno od najlepših vozila sa tom tematikom ikada! Vrlo verodostojno izgleda, bar sa ove strane. Meni je guseničar zanimljiv! Ovo ostalo, meh.